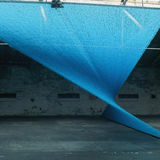 “AIRE-WAVE” was installed in the 200 x 15 metres roof space of Salts Mill, a former textile mill in Saltaire, built next to the river Aire in West Yorkshire. 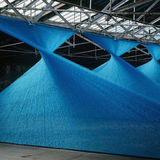 Threads join two straight lines parallel to the walls of the space and form a shape which recalls the movement of air and water. 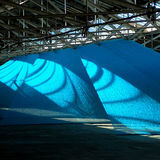 Throughout the day, the light that falls through the immense skylights created continuously changing drawings on the curved semi-transparent surface of the three waves. 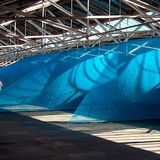 "During the era of manufacturing ‘from fleece to piece under one roof’ the current exhibition space accommodated the spinning department of the Salts Mill. 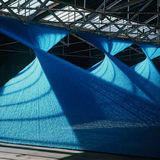 Bieli’s installation calls to mind the original purpose of this space using wool spun in Yorkshire. 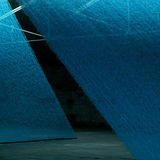 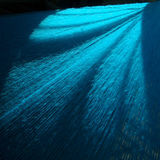 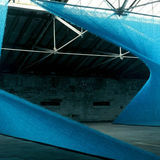 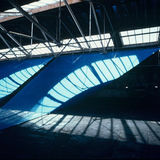 Stretching between the roof trusses and the floor thousands of blue mohair threads create a spatial drawing. 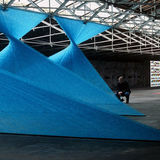 Like a suspended wave twisting over on itself, three sections move across the space inviting the visitor to walk around, see through and become part of the work."